During a career that spanned more than 70 years, Norman Corwin wrote, produced and directed for radio, television, film and the stage. Corwin succeeded in many facets of the entertainment business, but radio was his true passion. His insightful writing earned Emmy and Golden Globe awards. He received an Academy Award nomination for his script for the 1956 film "Lust for Life," the biography of Vincent van Gogh starring Kirk Douglas. But radio was Corwin's true passion. "I find it difficult to turn down an offer to be heard," he said in a 2001 interview on public radio. "Whether it's an anniversary, whether it's on the ending of a war, whatever the subject, I am ham enough to enjoy communicating to people, to an audience." Corwin, a creative giant of the Golden Age of Radio whose programs chronicling World War II are milestones in broadcasting, died Tuesday at his Los Angeles home of natural causes, according to the USC Annenberg School for Communication & Journalism where Corwin remained a writer in residence until his death. He was 101. Actor William Shatner, who narrated several of Corwin's later radio programs, called him a legend and his hero. He is "the poetic soul of discretion and a monument to artistry in America," Shatner once said. Throughout the 1940s, Corwin was well known to millions of Americans who depended on radio for their link to the world. His work during that so-called Golden Age of Radio ran the gamut of creative offerings, from variety shows to dramas, comedies to documentaries. Some of his most acclaimed programs dealt with World War II and provided perspective about a war being fought thousands of miles away. His writing brought the country together, inspiring patriotism, hope and optimism. He joined CBS in 1938 at the height of the radio network's glory, working with such broadcasting greats as Edward R. Murrow and Howard K. Smith. While his early work was behind the microphone, Corwin eventually turned his focus to writing, producing and directing. In 1941, he wrote "We Hold These Truths," a commemoration of the 150th anniversary of the Bill of Rights featuring the voices of Lionel Barrymore, Walter Brennan and Orson Welles. It was broadcast simultaneously on all four radio networks days after the bombing of Pearl Harbor. "We Hold These Truths" was added in 2005 to the Library of Congress' National Recording Registry, formed to honor sound recordings of unusual historical merit. In 1945, he penned "On a Note of Triumph," considered by many to be Corwin's masterpiece. It was broadcast nationwide on May 8, 1945, the day of the allied victory in Europe. In an introduction to the program, Corwin wrote: "I thought to consider what had been wrought, and why — what the victory had cost, what, if anything, we had learned — and what lay ahead in the way of global obligations and responsibilities." 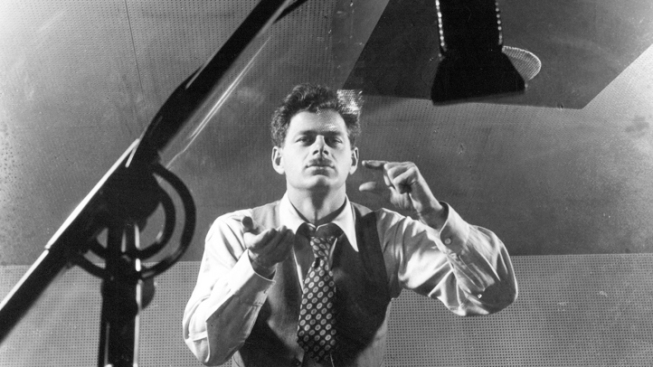 A film about that broadcast, "A Note of Triumph: The Golden Age of Norman Corwin," won the Oscar in 2006 for best short documentary. In the mid-1950s, Corwin turned to television and film. He wrote the first and final programs of a 26-part portrait of President Franklin Delano Roosevelt, titled "FDR," that aired on the ABC television network in 1963. A year later, he scripted a 90-minute examination of Hollywood for NBC titled "Inside the Movie Kingdom." Corwin wrote at least 19 books and several stage plays, including "The Odyssey of Runyan Jones." He received numerous awards in media and the humanities, including two Peabody medals. In 1993, he was inducted into the Radio Hall of Fame. USC Annenberg Dean Ernest J. Wilson III called Corwin "a true legend." ''His insightful, inspiring body of work has been absorbed into the American consciousness. He gave us the benefit of his knowledge, wit and keen observations through many decades, and he was a literary treasure." "My approach is distinct from that of searching only for what's wrong. I lay heavy emphasis on what is right because that too often escapes the awareness of a writer..I also place emphasis on rewriting, on the theory that all first drafts are trash. And that applies to my own first drafts. I think it's terribly important to read, to watch television and movies, and listen to radio, to read books, magazines, newspapers, even when the material is poor. A student should learn what makes it poor. "In sum, I urge my students to read widely. I believe in the benefits of intellectual osmosis." Corwin often bemoaned the current state of commercial radio broadcasting. "Today there is a plethora of a kind of radio that is very inexpensive to produce, talking heads," he said in a 2001 interview with Atlantic Public Media. "We are not commemorating and celebrating the great events." Corwin's innovative work was introduced to a new generation in the mid-1990s on National Public Radio. A series titled "13 by Corwin," a selection of his programs from the 1940s, was digitally remastered and distributed in 1996 as part of the NPR Playhouse series. Corwin greeted the new century with "Memos to a New Millennium," narrated by Walter Cronkite and broadcast on public radio. In a January 2000 interview, Corwin spoke of his optimism for the next 1,000 years. "As long as there is room for compassion in this world, we need not despair," he said. Born May 3, 1910, in Boston, Corwin began his career immediately after high school as a reporter for The Greenfield Daily Recorder newspaper in Massachusetts before turning to radio.